Getting approved for a credit card can be very tough. Before the recent financial crisis credit card companies would send out millions of pre-approvals to people who did not necessarily have the best of credit, now you have to search diligently to find a decent credit card that you will be approved for. The “great recession” is waning but it will be tough to acquire credit for a long time, here is a quick guide as to how to get approved for a credit card. The easiest way to get approved for a credit card is to do it the old fashioned way, simply apply for a card online or in the mail and hope to be approved. This may work for those of you who have a FICO score of 720 or better, but that alienates the majority of Americans. If your credit score is poor it will be much tougher to qualify for a credit card worth having, but that does not mean that it is impossible by any means, you simply have to work harder and do a little more research. If your credit score is very bad or you do not have much of a credit history at all, you should look into finding someone to co-sign your credit card application. Co-signing is very simple, it is when you find someone else you know to put his or her name on the application, once they do this they are jointly responsible if you cannot pay off your credit card balance. For example, if you apply for a credit card with a co-signer and end up getting it, but cannot pay off your balance a year later your co-signer is just as responsible for the debt as you are. This is a lose-lose situation for the co-signer, but a co-signer can make or break your credit card application. Your co-signer obviously needs to have good credit and he/she needs to be someone that cares about you so possibly candidates include: Parents, Grandparents, Aunts/Uncles, your Spouse or your boyfriend/girlfriend. The worst your potential co-signer can say to your request is “no” and as long as you act fiscally responsible, only buying things you know you can pay off your co-signer will never have to get involved. The first step in getting approved for a credit card is finding the right online credit card applications to fill out. If your credit score is in the 600’s do not bother applying for credit cards that require good to very good credit, you will simply be wasting your time. Years ago you may have been able to own a top tier credit card with mediocre credit but these days you are best off focusing on cards that are actually in your grasp. 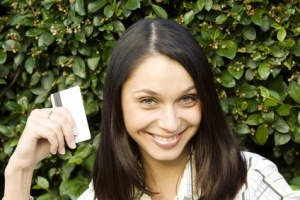 Credit cards aimed towards people with poor credit will generally have higher APR’s, but for a legitimate reason. Credit card companies take a bigger risk when allowing someone with poor credit to open up a line of credit, there is obviously a better chance that someone with a credit score of 630 will default [fail to pay back their line of credit] than someone with a credit score of 780.You may also end up with a smaller line of credit if you get stuck with a credit card for people with poor credit, but if you pay off your balance in full each month you will notice that your credit score will rise substantially in a short period of time. Once you find the online application that best meets your needs it is important to fill out the entire application truthfully and in its entirety. This seems like common sense, but you would be amazed at the number of applications that are not completely filled out or completely accurate. I know it is annoying to fill out a 3-5 page application online, or in any capacity for that matter, but 10 minutes of performing a mundane task is nothing if you end up getting the credit card that is perfect for you. A large portion of credit card application denials come when the application is not filled out correctly. Visa, for example, cannot afford to give a credit card to someone who does not list their full name, credit score, or complete address. While filling out the application, do not be afraid to give the credit card company a call! Tell the company which credit card application you are filling out and why you need the credit card. So much can be accomplished with a 5 minute phone call. The people who you will be talking to have a say in whether or not you will get the card so it seems obvious that you should try to “butter them up”. When someone can put a voice and character to a name they are much more likely to cut you some slack. Also once you get your credit card giving your credit card company a call is the easiest way to lower your APR or negotiate fees. Finally, if you do not hear from the company about the application in a week, call them up! Many credit card applications are simply forgotten, thousands are completed each day for all the different companies so it is fairly easy to forget about an application. If you do not hear from the company in any capacity for over a week it is in your best interest to give them a call to monitor the progress of your application.